Animal Parasiticides Industry « Global Market Insights, Inc. The competitive hierarchy of animal parasiticides market recently witnessed one of the most lucrative partnerships of the year, as Merial signed an alliance with the German pharmaceutical company, Boehringer Ingelheim. Post the successful merger, the latter has apparently decided to expand the production capacity of its animal health manufacturing facility at St. Joseph, which would undoubtedly help the company strengthen its position in animal parasiticides industry. Considering the huge demand for parasiticides and pet products, it has been observed that many other companies have also been attempting to ramp up their product portfolio. Recently, Elanco Companion Animal Health launched a massive product range of parasiticides, designed for preventing heartworm disease, whipworm infection, and flea infestations in puppies and dogs. The growing prevalence of zoonotic diseases in the animals is thus, likely to boost animal parasiticides industry share over the years ahead. As per estimates though, in 2016, animal parasiticides market was worth USD 5 billion. Regulatory bodies such as the U.S. Food and Drugs Administration (FDA), it has been observed, are also taking initiatives to promote the manufacturing of eco-friendly products. The U.S. Environmental Protection Agency (EPA) for instance, has instituted the President Green Chemistry Challenge Award to motivate manufacturers for developing environment friendly products, the honor of which would undoubtedly prove to be a major driving force for companies in animal parasiticides industry to focus on safer design and latest technology facilities. Driven by a stringent regulatory framework and the early adoption of neoteric products, North America animal parasiticides market is expected to chart out a lucrative growth path in the ensuing years. In fact, as per the estimates, in 2016, North America animal parasiticides industry covered 25% of the overall share, pertaining to the rise in pet population and animal farming. In the United States, the FDA is responsible for drafting the regulations for limiting the deployment of pesticides in animal-derived products. The association recommended that pet food needs to be hygienic and should not contain any deleterious residue, which may be injurious to animal health. 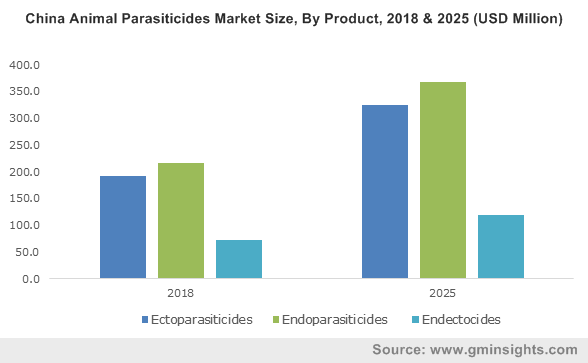 In accordance with the same, the FDA has enforced certain norms for parasiticide manufacturers, which would have a commendable impact on the product landscape of animal parasiticides market. In addition, the U.S. Department of Agriculture has also undertaken the responsibility for regulating veterinary biologics, prominently used for supplementing and enhancing animal immune system, to enhance their safety, effectiveness, purity, and potency. The initiatives undertaken by regulatory bodies would thus, leave a proportional impact on animal parasiticides industy size. Taking into account the fierce competition prevalent in animal parasiticides market, most of the animal health companies have been inclining toward the adoption of tried-and-tested growth strategies such as M&As. For instance, MWI Veterinary Supply, Inc., one of the most renowned distributors of animal health packages, recently procured Vetspace Limited. Through this acquisition, MWI aims to upgrade its product portfolio with the help of Vetspace’s cloud based practice management software over the years ahead. Speaking along similar lines, some of the renowned players partaking in animal parasiticides market share are Boehringer Ingelheim, Zoetis, Vetoquinol, Bayer, CEVA Santé Animale, Elanco, Perrigo Company PLC., Merck & Co., and Virbac Corporation. The commitment of companies toward animal health notwithstanding, regional governments have also been planning to structure guidelines in a bid to enhance livestock farming for breeding and meat. The British Poultry Council for instance, has drafted regulatory codes for chicken farming, which would have a proportional impact on parasiticides market outlook in the years ahead. Considering the extended presence of this business space across developed economies such as those of Europe and North America, major animal health companies have conveniently established their distribution centers in these continents. In fact, MWI Veterinary Supply, Inc., one of the prominent distributors of animal healthcare products, has established a total of twenty-three distribution centers across U.S. and one facility in UK, as on 2014. Another noticeable trend proliferating animal parasiticides market share is that apart from animal health firms, other specialized companies have also been striving to penetrate the business space lately. In terms of revenue, Global Market Insights, Inc., claims animal parasiticides industry size to surpass a valuation of USD 6.5 billion by 2024. This entry was posted in Healthcare & Medical Devices and tagged Animal Parasiticides Industry, Animal Parasiticides Market, Animal Parasiticides Market Analysis, Animal Parasiticides Market Growth, Animal Parasiticides Market Outlook, Animal Parasiticides Market Pdf, Animal Parasiticides Market Price, Animal Parasiticides Market Report, Animal Parasiticides Market Share, Animal Parasiticides Market Size, Animal Parasiticides Market Trends.